What’s the Difference Between a Chord Chart and a Lead Sheet? Lead Sheets have a notated melody line with chord symbols written above and may include words if it’s a song. Chord Charts simply show chord symbols with no notation. If the chord chart is referencing a pop song, it will generally include lyrics as well. In both cases, it’s up to the pianist to provide the left hand accompaniment in the right style and groove. If you’ve started embracing a more chordal approach to teaching (and even if you haven’t yet! ), then I’ve got a really handy resource of some fun chord progressions you might like to explore. 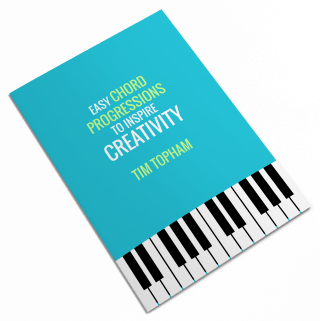 But before I show you the free download (below), I wanted to ensure you knew the difference between Chord Charts and Lead Sheets in piano teaching. Lead Sheets have a notated melody with chord symbols above. Generally, the player’s right hand would play the melody as written and their left hand would improvise an accompaniment using the chord symbols. Skilled players will “hang” a chord under the melody note of the right hand so their pinky mainly plays the melody while the rest of the fingers of their right hand play as many chord tones as possible, using the chord symbol above as a guide. 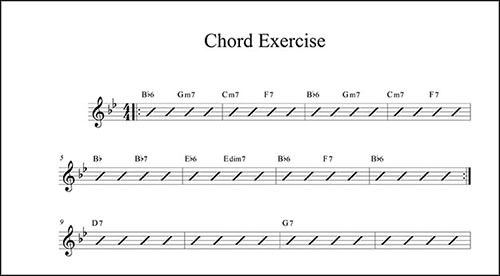 Chord Charts are simply chord symbols with no notation (see Example 2 below). If the chord chart is referencing a pop song, it will generally include lyrics as well. Some chord charts feature basic information like key and meter (Example 1), others just the lyrics (Example 2). Chord Charts are designed to be used for accompaniment, that is, the pianist playing from a Chord Chart generally won’t play the melody. Instead, they’ll be using this chord chart to accompany a singer (perhaps themselves) or other instrumentalist. In order to play effectively from a Chord Chart, a pianist needs to know how the song goes, the tempo, feel and style of the piece as this information is often not shown (eg. Example 2). In order to play effectively from a Chord Chart, a pianist needs to know how the song goes. Which Type Should I Use in My Teaching? In my opinion, students should know how to play from both a lead sheet and a chord chart. I’ll often introduce chord charts when students come to lessons wanting to learn a pop song. Even if the notated sheet music is available, it’s often better to learn from the chord chart as students quickly get a feel for the outline of the piece, they have quick success and want to practice more. When working with pop, I always try and encourage students to sing while while they accompany themselves. We all know how hard it is to play the rhythms found in pop music. This is because pop songs were never designed to be piano solos. Much better to help our students understand that, in modern music, the piano is generally just an accompaniment instrument which supports other instruments or singers. Chord charts are great for this. If the student isn’t keen on singing, they can play along to backing tracks available on a couple of apps that every piano teacher should have at his/her disposal. I go into full detail about which apps and how any classically-trained piano teacher can teach pop music with confidence in my online training course: PianoFlix: Teaching Pop Piano which is available as part of my Inner Circle Membership. In order to play from either lead sheets or chord charts, students need to have a chord vocabulary. This means that they’ll need to know how to form a triad and what to play in each hand for a variety of roles. They should also learn a whole lot of left hand patterns and styles to give a ‘feel’ to their playing. PS. Stay tuned for this Wednesday’s blog post when I’ll be releasing my Ultimate LH Style/Pattern Sheet. However, learning a chord vocabulary without a musical structure can be pretty meaningless. Even if it’s only a small part of how you teach, having ready access to a list of chord progressions that sound good (and, more importantly, that students of all ages enjoy playing) makes life so much easier! Thankfully, I’ve put together a handy guide of Easy Chord Progressions that you can use with students of any age or ability. In the three-page guide, you’ll find 8 of my favourite progressions that work brilliantly in lessons. These aren’t recognisable pop song progressions (you can check out my recommendations of the Top 10 Pop Songs for Piano Students here), instead, these are just progressions that sound good and form the basis of great teaching points as students develop. If this style of teaching appeals, you can also get my 10 chord teaching lesson plan which sets out step-by-step what you can do to teach chords to a student over the period of a term or semester in a logical, progressive manner. This is also available free to Inner Circle members and takes you step-by-step through what 10 weeks of teaching about chords would look and sound like, including what the student needs to do each week for practice. If this style of teaching is a bit new to you and you want to see how I teach these chord progressions, please download the handout and watch the video below. It shows you a little bit about how to voice the chords, what some of the notation means and some of the style/creative activities you can do with students. I tend to keep things really rhythmic and ‘poppy’, while always being very simple. Even if you’ve never tried this kind of thing before, I guarantee you’ll have some fun with it and students will really connect to the material because it sounds like the pop music they know so well. If you want your students to truly understand music (and not just play it), your teaching needs to include a chordal approach. Chords and harmony are one of the key building blocks of music but so often overlooked in the tradition lesson. Break out of your old approach, throw some chords into your next less (particularly with a teen or adult) and watch your students thrive (and learn a whole lot more in the process!). P.S. We also spoke about chord charts and lead sheets on my podcast episode with Susan Deas. Click here to listen to that episode!